Caledonia Housing Association, Perth & Kinross Council, Fairfield Housing Co-operative and Kevin Stewart MSP gathered this week to commemorate the completion of the final stage of the Muirton regeneration project in Perth. 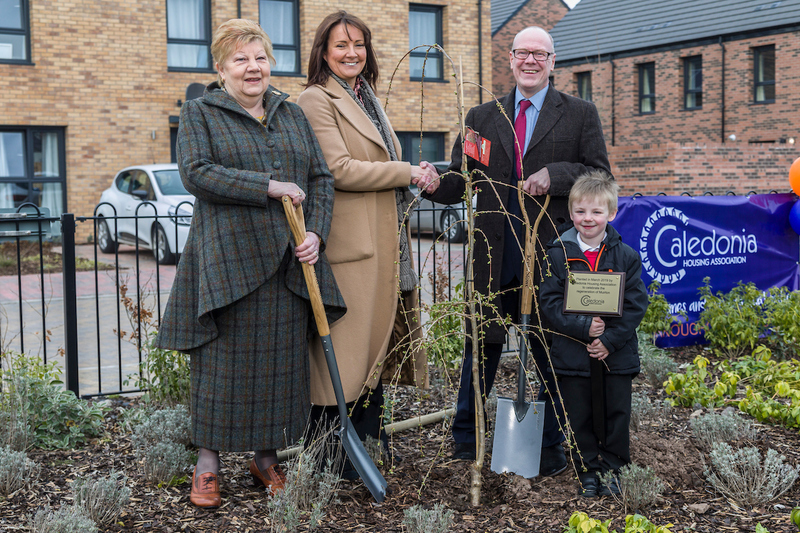 To mark the end of the regeneration, housing minister Kevin Stewart, Caledonia Housing Association chief executive Julie Cosgrove and Caledonia Housing Association chairperson Penny Coburn planted a blossom tree in the Carnegie Place play area along with a ceremonial plaque with a little help from Alfie Smullen, one of Fairfield Housing Co-operative’s young tenants. The £52.5 million Muirton Regeneration has spanned 12 years with nine phases to the regeneration project, undertaken by a partnership agreement between Perth & Kinross Council, Fairfield Housing Co-op and Caledonia Housing Association with Caledonia Housing Association leading the project. The project has seen the demolition of 564 dwellings, predominantly tenement flats, replaced with 409 mixed tenure new homes, on the site adjacent to the former St Johnstone football ground. This has included 180 homes available for affordable rent by Caledonia Housing Association with a further 84 homes for affordable rent by Fairfield Housing Co-op. Caledonia Housing Association have also provided 46 homes for sale via the Scottish Government’s Shared Equity scheme and 101 homes have been developed for private sale by Urban Union. The long-term regeneration objectives were to revitalise an area of Perth with high levels of unemployment and high levels of deprivation, creating a greater sense of community pride and engagement. The development masterplan has created a community flat, neighbourhood play areas and an innovative electric car sharing club for residents via Co wheels. A developer has appealed to the Scottish Government for consent to create a new care home in St Andrews. Aberdeen-based CAF Properties revealed the complex would replace the town’s Gibson House. Fife councillors refused planning permission for a 40-bed care home in leafy Hepburn Gardens, part of the town’s conservation area. Objectors to the proposal has warned of the impact of “intensive commercial activity” in a residential area. However, CAF Properties has argued its conversion of number 92, known as the White House, and erection of two, two-storey extensions was needed by the William Gibson Trust, whose current home in Argyle Street is said to be dated and not fit for purpose. 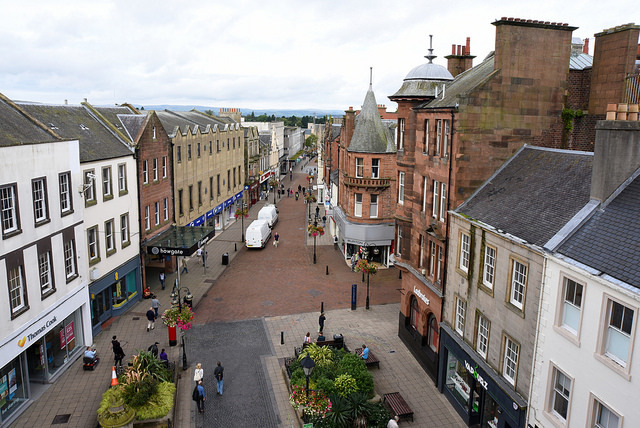 The revitalisation of Falkirk’s town centre took another significant step forward as the council agreed to take part in a new partnership being set up to deliver an action plan. The partnership will comprise representatives of Falkirk Council, Scottish Futures Trust, Falkirk BID, Healthy High Streets and other bodies. The action plan will help to reinvigorate retail provision, create new opportunities for residential housing, enhance infrastructure and establish new ‘hubs’ to attract more footfall to the town centre. Alongside the new partnership a Town Centre Forum will connect with retailers, property owners and residents as a sounding board for the partnership as the action plan progresses. Work on the delivery of a new council HQ and Arts Centre will be progressed alongside the partnership, anticipating that this will provide a catalyst for investment by the private sector in the town centre. The partnership follows on from a number of successful workshops that took place last year with interested parties, gathering opinions and information to shape the plans for the town centre and enable partnership to be set up. Aberdeenshire Council has announced essential resurfacing works on the A920 Huntly to Dufftown Road from the Junction of the A96T to Junction C115S Artloch. The work is programmed to take 2 weeks commencing Monday, March 18 and will involve full width carriageway resurfacing and edge repairs. The works form part of an annual Road Maintenance Programme 2018/19 and will cost £125,000. Approximately 900 tonnes of new asphalt material will be machine laid which represents a considerable investment in the road.